Trebarwith Strand is a popular family beach known for its fine golden sands, located on the North Cornwall coast - between the ever popular villages of Port Isaac and Tintagel. Located at the very bottom of a deep valley, with many attractive views along the Heritage Coastline - with Gull Rock, lying just of the beach providing an interesting focal point to the views. The route to Trebarwith Strand is via a narrow single track lane, running from the B3263, through a narrow steep sided valleydown to the small hamlet of Trebarwith Strand. 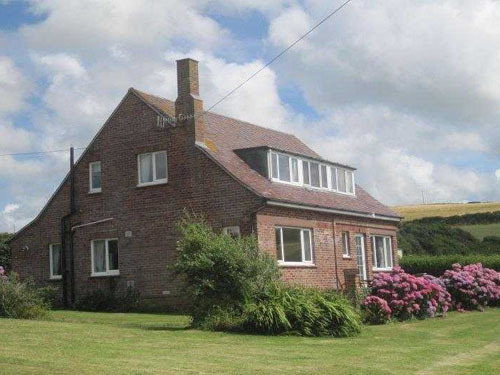 At the end of the lane, Trebarwith, has car parking, cafe, shop, toilets and a pub serving food. The Strand café is a popular stop at the Strand - selling a range of freshly prepared food and home made cakes. There is a small surf shop that provides the standard "Bucket and Spade" type holiday requirements as well as offering wet suit and body board hire. Trebarwith Strand Surf Shop began life in the 1920's as "Keats surf shop"- hiring out surf boards. 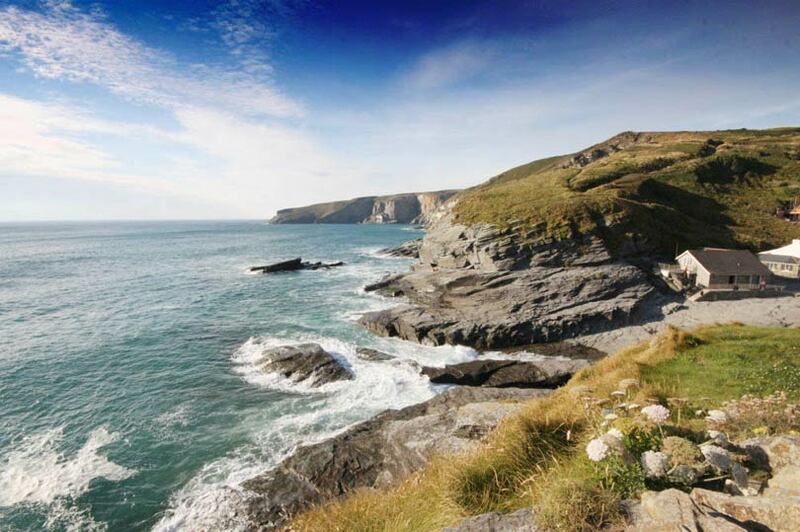 Trebarwith Strand Beach, is easily accessible from the parking area via a short walk down the hill. The beach has a reasonably large area of sand and rocks at low tide - and is a firm favourite with locals and Holiday makers. At high water the sands are completely covered by the incoming tide. But as the tide recedes, a superb all round beach is revealled, that offers good bathing and surfing with plenty of rock pools and small alcoves to explore along the cliff edge. Lying in the bay, just off of the beach, is Gull Rock - an imposing cliff stack, that provides a home to many local sea birds. The picturesque setting with Gull Rock lying just over 600m from the shore, makes the area popular as a TV and Movie location. The western edges of the beach, below the cliff edge car park of the Port William Inn, is mainly a rocky platform, with some sand at the the lowest point of the tide. This stretch of beach is not safe for familly use, due to the rocks and thestrong currents, but is popular with local surfers. Trebarwith Strand's main section of the beach is a large sandy expanse ideal for family holidays - There is a lifeguard patrol on the beach during the peak holiday season. At low tide, the majority of the main beach is flat and sandy, with rocks and rock pools along the Eastern edges as you move around towards Tintagel. Along the Stand towards Tintagel, below the old Cliff face quarry workings ( and a few remnants of a 19th century water powered copper mine), is Lill Cove. The Cove is accessible from the main beach at Trebarwith at low tide, or via a small gully between rocks, as the tide covers the beach - but the sea blocks this route at high tide. As an alternative, there is a small footpath up from Lill Cove to the coastal path. Vean Hole is a small beach at the Eastern edge the Cove accessible as the tide recedes. At the Eastern edge of The Strand is Hole Beach. The beach is only accessible at low tide but it is a popular fishing spot. Underwater safaris and snorkelling are also popular at this beach. 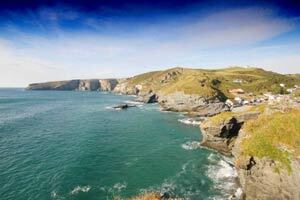 From Trebarwith there are some very popular cliff top walks. the route from Trebarwith to nearby Tintagel, passes the old Coastal slate quarries, where slate was extracted from the cliff faces. There were 9 working slate quarries along the coastal path between Tintagel's St Materiana Church and Trebarwith Strand. The workings were in operation from the 14th century until the 1940s. Trebarwith Strand had two of the biggest slate quarries in the whole of North Cornwall - The Lanterdan and West quarries above Vean Hole and Hole Beach at Trebarwith. The Lanterdan quarry is easily identified, as there is a tall, distinctive "scullock" - a stack of poor quality rock that was left by the quarrymen forming a pinnacle of rock that was not worth mining, as the more valuable material around it was remove. Lanterdan Quarry is a site of geological interest (with brachiopod fossils found in the slate as well as "monazite" a rare-earth mineral) the area is now owned and managed by the National Trust.